Of course the novel itself is still a mess and needs heavy revision. And there's about 52 other things I need to get done before this month is even over. I'm getting stat counts but no one's hitting any actual article pages. Edit: It's looking like most of this uncorrelated traffic is coming from Russia. If they're here for my Pokemon, FORGET IT. Update: I am not the only one getting this weird traffic. Infidel753 at his political blog also reported on getting bizarre traffic, and Pinku-Sensei's getting that treatment as well. Labels: blogging, what did I do to upset Canada now?, what did I do to upset Russia now? I am wary of the budget woes I currently have, but I need to enjoy life once in awhile, dammit. Also, the Tampa Bay Comic Con has a couple of presentations on writing that Saturday August 6th I wanna follow up on. Also also, with the release of Pokemon GO, I'm sorely tempted to see if the convention hall will have working WiFi and a ton of PokeStops. Here's hoping there's a Lure drop of EPIC proportions that weekend. Alas, I WILL NOT Cosplay this year. It gets too hot and sweaty and carrying the lightsaber everywhere gets complicated etc. etc. I will document the atrocities as best I can. Based on the popular Pokemon trading/training/battle game, Pokemon GO is an update of the original game from the early 1990s. This time, the game's draw is that it can be played in a real-world environs. GO overlaps onto existing map locations (called "augmented reality") and places the cartoon battle animals - currently the original 150 creatures - into these locations for people to "catch" them for powering up, evolving, and fighting other players' Pokemon. 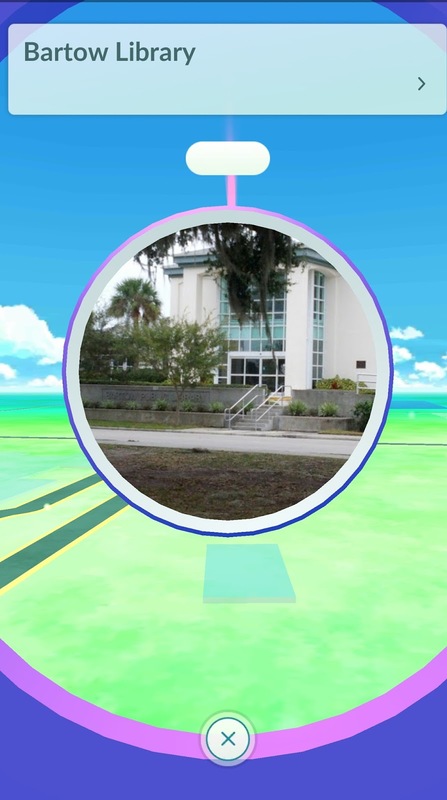 Meanwhile, real-world public areas - parks, churches, malls, libraries - are set up to serve as either PokeStops - places for players to resupply themselves with needed gear - or Gyms - places for players to battle their Pokemon to control that Gym as a Trainer. This means that people playing the game HAVE to go to these real-world locales to do what they do to level up and win. The library where I work is a PokeStop: that is, we can be a place for players to recharge (there are two Gyms nearby). 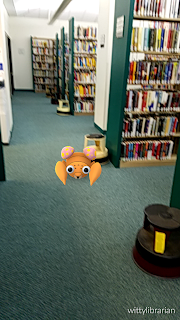 PokeStops can also have Lures running in half-hour intervals that summon Pokemon into range for capture, which means every so often players - kids, teens AND adults (those who played in the 1990s with nostalgia and whimsy) - will gather at our library primarily to restock and reload. This all came as a sudden shock: although news about GO had been out for a year or more, nobody really understood the real-world applications of this game until it got the huge response from millions of players suddenly swarming about in places that didn't realize they were PokeStops/Gyms. The question is, how can libraries benefit from this real-world development? 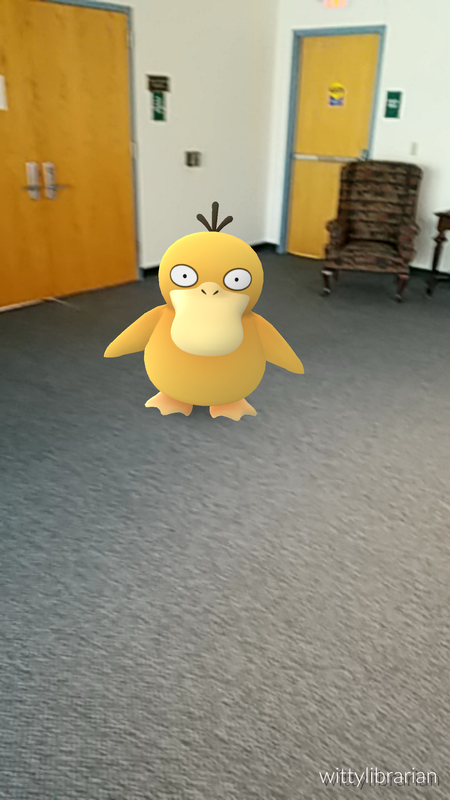 There's a couple of resources librarians can read up on to gain understanding of Pokemon GO, and also get tips on how to market/outreach to the kids/adults/families coming in to snare themselves a PsyDuck. School Library Journal has a link, ALA has a blog page on their Library Services to Children site, and the Public Library Association is diving into the mania while the going's good. 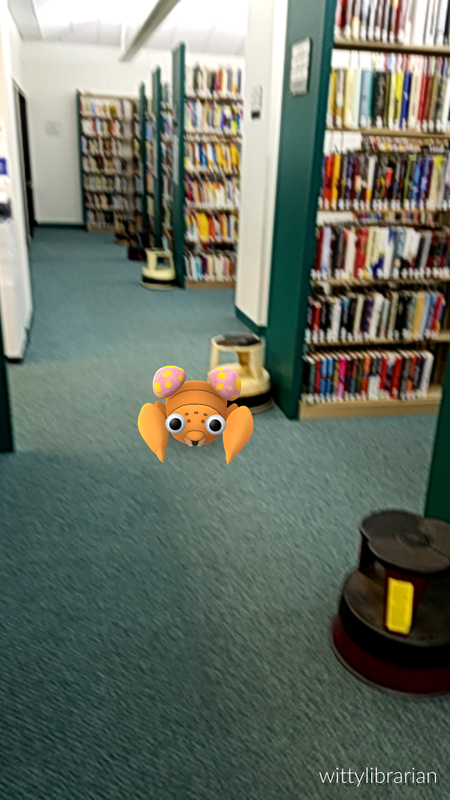 The best suggestions are to advertise locally - and early and often - that the library is a game location. I've been doing that with City of Bartow Library's Facebook page, and am looking to create a few more online tags for people to hear the news. Creating signs and banners is an easy step to take. 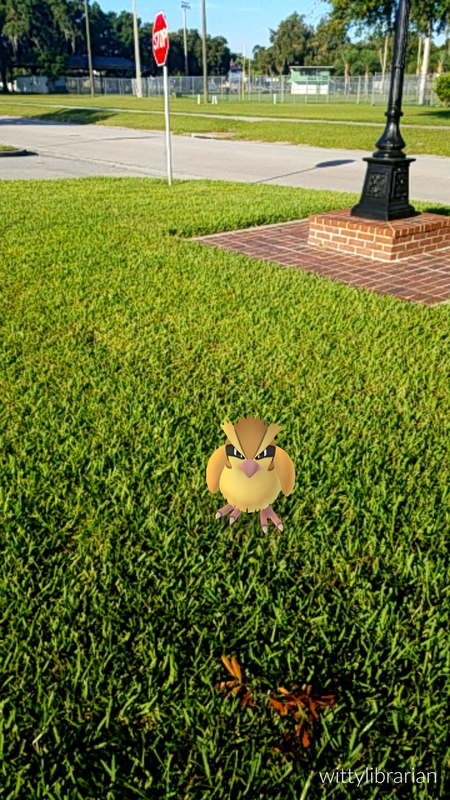 One idea would be to host events: As a PokeStop, I can plan ahead and announce a Lure running on a specific day and time to draw in those who'll want to benefit from an increase in Pokemon to capture (a test run showed me the Lure draws in about TRIPLE the amount of Pokemon, sweet). A wonderful suggestion by a library group promoting GO: using a 3D printer if you got one (WE DO) and creating Pokemon badges (WE COULD) that kids can pick up if they show that they're on the game and winning certain things. Along with the badge we'd give them a library bookmark promoting our hours and library events. One other thing libraries have to do: Remind people playing the game to stay safe. There is a risk to playing GO because of the requirement to play in the real world. It involves walking outdoors, near major traffic areas sometimes or in public parks with dangers involving remote spots or late-night activities. There are a lot of serious safety concerns. We've got to make sure people in our libraries - in our communities - stay safe as best as possible. 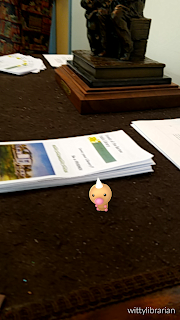 Meanwhile, the biggest problem: Keeping up with Pokeballs. It's gonna take a lot of balls to play Pokemon GO. I may have mentioned from time to time that I had purchased a publication deal with Xlibris a few years ago. Well, ten eleven years ago, actually. Long story short, I decided to just get the contract done with, take a sampling of essays/articles I write on my political blog You Might Notice a Trend, and put it into book form. It's doable: many a newspaper or media columnist collect their works in such a way - Molly Ivins for example - to have available as a collection. Sort of like a Greatest Hits album. So, I went and put my political rants into something I can show to my friends and enemies. Surviving the Age of Obstruction: Notes on the Obama years. 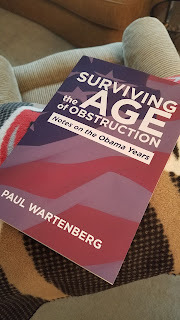 It's a look back at eight years of political madness, a pro-Obama, anti-Republican work that delves into my apostasy and my observations on how Obama - and the nation - endured it all. I submitted the final proofing two weeks ago. The book has been available on Amazon.com and Barnes and Noble's websites since last week. I just got a copy from the publisher this weekend. There is something incredibly satisfying about holding a physical copy of your book. A tangible sensation of completion, of getting past a finish line. 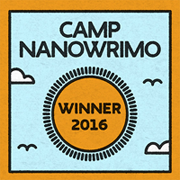 It's different than publishing an ebook, as there's a lack of a trophy of sorts - the printed book - to make that completion feel real. Just to note, the process from submitting the rough draft to completed physical copy has sped up the last time I did this. Last of the Grapefruit Wars - my short story collection - took a few weeks to go through the editing and proofing process, and then took another two months for print availability (the point of Print-on-Demand is that the book is saved on file and physically printed on an order-by-order basis). I know some of the people reading this blog may not know about my political ranting blog, but you can check that out, I have the link available above and over on the right menu lists.